MINNEAPOLIS - October 27, 2017 - New data from a Phase I clinical trial led by Clark Chen, M.D., Ph.D., Lyle French Chair in Neurosurgery and Head of the University of Minnesota Medical School Department of Neurosurgery shows more than a quarter of patients with recurrent high-grade glioma, a form of brain cancer, were alive more than three years after treatment. 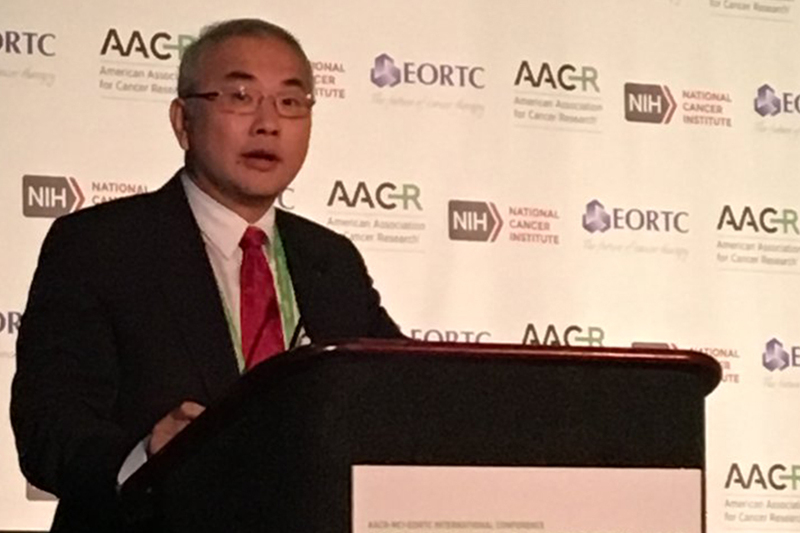 As Chen explained at the AACR-NCI-EORTC International Conference on Molecular Targets and Cancer Therapeutics two steps were involved in the treatment of the 56 patients who participated in this clinical trial. First, patients were injected with Toca 511, which is a replicating virus that only infects actively dividing tumor cells. Once inside the cancer cell, the virus delivered a gene for an enzyme, cytosine deaminase (CD). As the virus began to replicate and spread to other cancer cells, it programmed them to make CD. Next, patients received a pill, Toca FC, which is an inert compound. Once inside the cancer cell, CD converted Toca FC into the anticancer drug 5-fluorouracil, which killed the cancer cell. In addition to destroying the cancer cells, 5-fluorouracil killed certain immune suppressive myeloid cells, thus boosting the patient’s immune system to recognize and attack the cancer cells. “The treatment we tested in this trial delivers local chemotherapy specifically to the brain tumor. Toca 511 and Toca FC work together to turn the brain tumor into a factory that produces an anticancer drug while also activating the immune system through a combination of mechanisms, which together work to attack the cancer,” Chen said. Dr. Chen also noted that five patients are experiencing a durable complete response with a median of at least 35.7 months. Within a subgroup of 23 patients, there were an additional five patients who achieved stable disease, bringing the number of patients who derived benefit from Toca 511 to 10 (or 43.4 percent of the patients who underwent Toca 511 therapy). According to Chen, the median survival in this trial is nearly double that of historical data. In the subgroup, median survival was 14.4 months, compared to approximately eight months for historical controls. This study was a single arm trial without a control group which acted as a limitation. “The ongoing randomized phase II/III trial will be important to confirm the promising safety and efficacy results reported in this Phase I study,” Chen noted. This study was sponsored by Tocagen. Dr. Chen is a consultant for Tocagen and a participating investigator in the Toca 5 trial. CONTACT: Naomi McDonald, Director of Communications, University of Minnesota Medical School, naomim@umn.edu, (612) 301-9525.